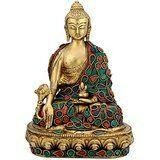 Medicine Buddha protects living beings from physical and mental sickness and other dangers and obstacles, and helps them to eradicate the three poisons attachment, hatred, and ignorance which are the source of all sickness and danger. Medicine Buddha came with his two main disciples, Radiance of the Sun and Radiance of the Moon, as well as a vast retinue of thousands of other disciples. Size : 8 Inches Height X 6 Inches wide X 4 Inches depth. Weight : 2 kg.Material : Brass, With Turquoise and other coral stone Handwork. Deepen your worship or add distinction to your decor with a genuine handmade Indian statue unlike anything you've seen before. Order the Handmade Indian Brass Idol today.